The women’s basketball team has been playing non-stop, wrapping up their regular season this past Saturday, Feb. 9. On Friday, Jan. 25, the Cardinals beat Bates at home, 67-42. Tara Berger ’19 and Caleigh Ryan ’22 both recorded double-doubles, helping the team secure this win. Ryan, unable to score in the first half, recorded 18 points in the final 20 minutes of the game. As if that wasn’t enough, she also grabbed 12 rebounds (nine of which were offensive), three steals, one block, and one assist. Due to the Red and Black’s aggressive defense, Bates could not manage to score more than 15 points in the first half. The Cardinals out-rebounded the Bobcats, 64-36, and outscored in second chance put backs, 17-4. This win put the team at 11-7 overall and 3-3 in the NESCAC. The women’s team had their senior day game, honoring captains Gorman, Berger, and Chynna Bailey ’19 on Saturday, Jan. 26. Head Coach Kate Mullen honored these players before the game. All three joined as first years in 2015 and have greatly contributed to the team and the program ever since. Yet the game ended with defeat as the Cards lost to No. 6 Tufts, 71-48. Gorman led the team in points, with 15, while Ava Tompkins ’20 led the team in assists, three, and Bailey recorded the game-high for steals, four, and grabbed eight rebounds. Berger recorded her seventh double-double of the season, scoring 10 points and taking 11 rebounds; she also blocked four shots, a game-high. The Red Birds ended January with a win, defeating the Massachusetts Institute of Technology (MIT) 46-44 at home on Tuesday, Jan. 29. Berger and Ryan again both recorded double-doubles to help secure this difficult win. Berger led the game in points and rebounds, scoring 14 points and grabbing 15 boards. Emma Roush ’21 led all players with three assists, and Marina Petruzzi ’22 led the bench with nine points. The Cardinals dominated the glass, with a 53-26 lead in rebounds. Once again, Wesleyan’s defense helped secure a notable win for them, shutting out MIT in the final minutes of the game. February started with a tough loss for the Cardinals, losing 80-76 against Trinity. Although in the end the Cards did not get the win, it was still an impressive game for the team. Gorman scored a season-high of 25 points, keeping the game close. Berger recorded another double-double, with 19 points and 14 rebounds. Ryan and Petruzzi both scored impressive numbers, 14 and 11, respectively. The team played well together, however, they could not manage to secure the win in the last quarter. The Red Birds went on to defeat Vermont Tech in a blowout game, 93-42, on Tuesday, Feb. 5. Berger led the team with 15 points. First-year Maddie Clark recorded a season-high of 10 points, while Tompkins led the game with five assists, and Ryan and Katy O’Connor ’21 led the team with 10 rebounds. This victory put the team at 13-9 overall. On Friday, Feb. 8, the team won against Colby College, 78-59, securing a spot in the NESCAC Tournament. Gorman scored a game-high 23 points, and Berger yet again recorded a double-double with 21 points and 15 rebounds. 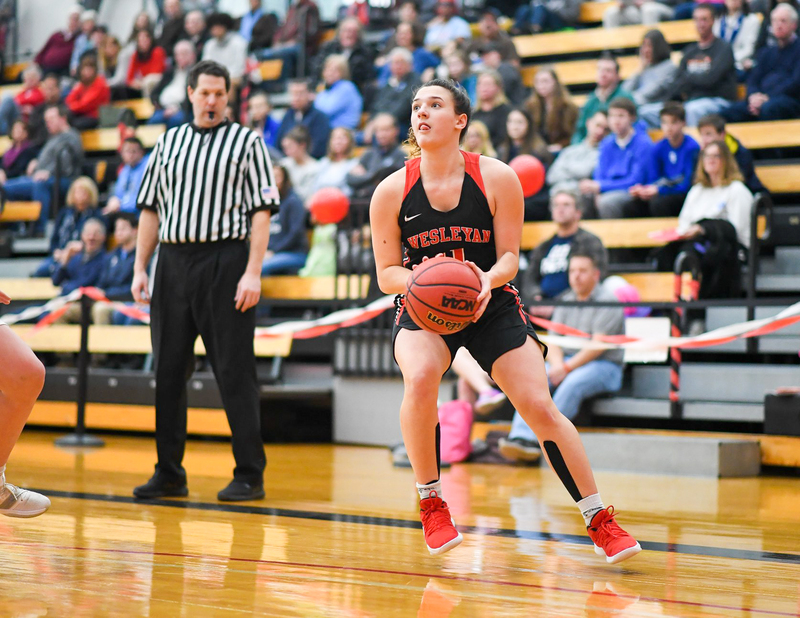 Petruzzi dropped 12 points off the bench, and Bailey added seven points to the scoreboard; she also grabbed six rebounds, recorded two steals, and a game-high five assists. This win put the team at 14-9 overall and 4-5 in the league. Gorman also made history when she became the 12th player in Wesleyan’s history to score 1,000 career points. She recorded 23 points, the exact number she needed, in a 92-75 loss against No. 1 Bowdoin on Sunday, Feb. 9. This game ended regular-season play. Make sure to congratulate the team on the end of their regular season and support them as they make their way into the NESCAC Quarterfinals on Saturday, Feb. 16 at 3 p.m. They will play either Amherst or Hamilton depending on the outcome of Tuesday’s game. Alissa Dobrinsky can be reached at adobrinksky@wesleyan.edu.